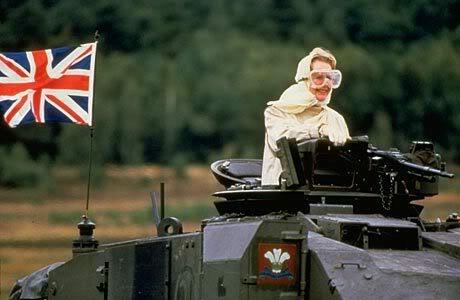 STRAIT-laced Maggie Thatcher often had her staff in fits of laughter with saucy one-liners – without knowing why. The three times PM, who died last week, was first to admit she wasn’t a natural wit and never quite grasped a double meaning. Her dry sense of humour was a nightmare for speech writers who feared she might fluff the punchlines. But some of her best and most hilarious gags were delivered unintentionally. Her prim and proper upbringing led to a string of unwitting quips on the world stage which left her aides stifling their giggles. On another occasion, she was puzzled when guests roared at her after-dinner speech as she described how a distinguished colleague had met his wife while “on the job”. Troops were close to tears when she made a flying visit to the Falkland Islands after the defeat of the invading Argentine army in 1982. She was invited to sit in the range-finder’s seat astride a large piece of field artillery. Mrs Thatcher naively dropped a similar clanger while inspecting garden implements on a flying visit to a hardware shop in Fulham, south west London. Lady T was a stickler for buying British and tore into journalists who used Japanese tape recorders during interviews. She even made them open their jackets to check whether their suits had come from Italy or Hong Kong – and would give offenders one of her infamous “hand-baggings”.